Marshall reveals its first two Alexa smart speakers, with Google Assistant to follow | What Hi-Fi? 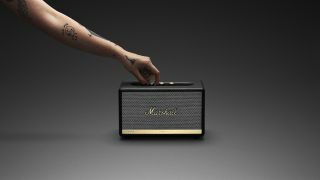 Marshall has unveiled its first two smart speakers, due to go on sale this autumn, and promises more products and voice-assisted services to follow. Resembling a pair of the company’s amplifier heads, complete with those so temptingly tactile control dials, the Action II Voice and Stanmore II Voice are the opening acts in the Marshall line. In a year in which the guitar side of the brand has looked back to classic British tone with its Origin series of amplifiers, it appears the home audio vision is very much set to the future. Compatible initially with Amazon Alexa – with Google Assistant to follow later in the year and further, unnamed services due to be added – both speakers will feature Class D amplification, reflex ports and custom-tuned drivers to deliver the clout and rich tones synonymous with the brand since Jim Marshall began building amplifiers in London more than 55 years ago. Customers won’t have to wait long to try out the Action II Voice, the smaller of the pair, which goes on sale on 2nd October with a suggested retail price of £269. The Stanmore II Voice, which we have pictured above, won’t be available until 9th November and will cost £349, but by then we may have more news at least on when Marshall will be adding Google Assistant. It’s been quite a while since we’ve reviewed anything from Marshall, but we’ll be sure to give you front row seats when we get to crank up this pair.